UAE President Sheikh Khalifa has asked for the formation of a national emergency committee to provide assistance to people affected. Kerala, facing one of the worst floods in a century, has been offered help by the United Arab Emirates. The UAE is to form a committee to help flood-hit areas of the state, a report said. Sheikh Khalifa, the president of the UAE, has asked for the formation of a national emergency committee to provide assistance to the people affected by the floods, news agency ANI reported. The Vice President of the UAE, Sheikh Mohammed bin Rashid Al Maktoum, also said that the country has a special responsibility to help and support those affected by the heavy floods, which resulted in 324 deaths and over 3 lakh people being displaced from their homes. The UAE is home to several people from Kerala who have moved there. "The people of Kerala have always been and are still part of our success story in the UAE," the vice president tweeted. 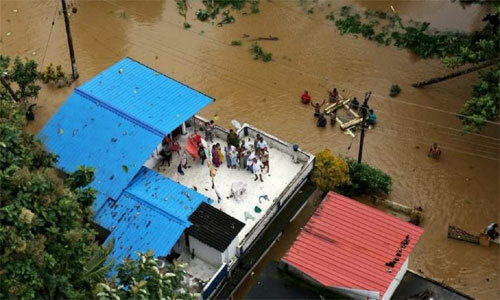 Hundreds of thousands have been shifted to relief camps in Kerala as nearly 100 dams, reservoirs and rivers have overflowed, roads caved in, sections of highways collapsed, and homes swept away amid warnings of worse weather to come. More than 30 military helicopters and 320 boats are attempting rescues across the state. The airport in Kochi has been shut at least till August 26 and flight operations have been shifted to state capital Thiruvananthapuram. Rail services across the state and the metro service in Kochi have been hit too. Prime Minister Narendra Modi has visited the state and has held a meeting with Kerala Chief Minister Pinarayi Vijayan to discuss the critical situation. Kerala not only part of UAE sucess story but of also other Gulf countries also. Long live UAE and other countries of the Gulf who have allowed Indians to work on their soil for their benefits and Indian benefits. May allah bless all the gulf countries.